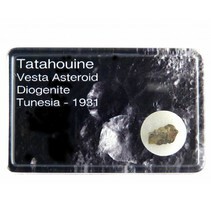 Tatahouine meteorites from the asteroid Vesta. Beautiful green color, only 12 KG known on earth! The Tatahouine is a meteorite that's classified as a Diogenite. Striking is the green color of the meteorite that hit the Earth near Tatahouine Tunisia on June 27, 1931. Scientists have established that the meteorite is a piece of the asteroid Vesta. This asteroid is the third largest in the asteroid belt between Mars and Jupiter. There is only 12KG this meteorite known! This makes the Tatahouine meteorite a real rarity. These Fragments are purchased from a French meteorite hunter that found this pieces himself in Tunisia. We have large and small fragments in nice display boxes with pictures of the asteroid Vesta. The collecting boxes have a size of 5.8 x 3.8 x 1.6 centimeters. On the inside there is a foam layer.